Oscar township (township 134, range 44) was organized by the county commissioners on July 1, 1873, and given the name of Christiana. The petition for the organization of this township was dated June 20, 1873, and contains the names of forty-three signers, the largest list on any of the early petitions. The list of names follow: A. O. Lastern, Telver A. Moe, Martin Trenne, Adolph Wallen, John Danielson, Charles Danielson, August Johnson, Casper Lein, Anders Johnson, A. Anderson, Knut Olson, Ole Knutson, Johan A. Dornstad, Amund Olsen, Gilbert Christianson, Louis Engstrom, Mekkel I. Sen, Michael A. Backen, John Snigedaklen, Ole Hough, Engebret Olsen, Johana Olsen, Edward Olsen, Peter Gilbertson, Peter Leies, S. Olsen, Hans P. Petersen, Jacob W. Chaffen, John Lies, Ole Johan Stras, Lars Parlson, Peter Chrestenson, Ole Christensen, Gilbert Hansen, Carl A. Bakken, Johan J. Jlares, John Jacobson, Ole Peterson, John Engebrights, Amun Mortensen, Morten Johnson and Reed Helgesen. The first election was held at the house of Ole Sletvold on July 25, 1873, and the following resolution was passed by the commissioners on Sep­tember 4, 1873, but was rejected by the state auditor: “Resolved, that the name of the township 134, of range 44, shall be Sletvold instead of Chris­tiana.” Until 1872 this township was a part of Wilkin county, but by the legislative act of that year and the subsequent election provided by the act, it was attached to Otter Tail county along with the five congressional town­ships of range 44, and has since remained a part of the county. Oscar was organized at the July session of the county commissioners along with Trodhjem. This township is bounded on the north by Trondhjem, on the west by Wilkin county, on the south by Carlisle and on the east by Eliza­beth. 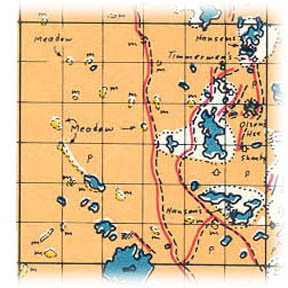 There are some fifteen lakes in the eastern and southeastern part of the township, but these are all small except Haldorsen on the east, Oscar on the south, and Christopherson in the northeastern corner. The general surface of this township is very broken, ranging from one thousand one hundred to one thousand four hundred feet above sea level. There are no streams flowing through this section and the lakes have no outlets. The western side, however, is less broken and the farms on the latter side are much better. There is no town within the limits of this township, although there was formerly a postoffice called Oscar located in section 15, but with the advent of the rural routes this has ceased to exist, it seems rather strange that there has never been a town platted in this section, as the main line of the Great Northern railroad passes diagonally through the town­ship. Carlisle, in Carlisle township, is just across the line on the south and is a great benefit for the inhabitants of this section; Elizabeth, on the east, is another small village which serves the people of this township. The town hall is located in the center of the township, in section 16. One of the many Indian mounds in the county is found in section 9 of this township. There are four churches in this township, located as follow: Sections 30, 35, 27 and 11. There are three schools in sections 8, 32 and 11. A ceme­tery is located in section 19 and another in section 27. The present township officers are as follow: Supervisors, Peter Loken, August Korth and Henry Haldorson; clerk. C. O. Kantrud; treasurer, John E. Sletvold; assessor, C. O. Kantrud; justices, C. F. Braatelein and C. O. Kantrud; constables, O. K. Asberg and Carl A. Sateren. Population totals in state and federal census summaries. Places of birth for Oscar Township in the 1905 state census.